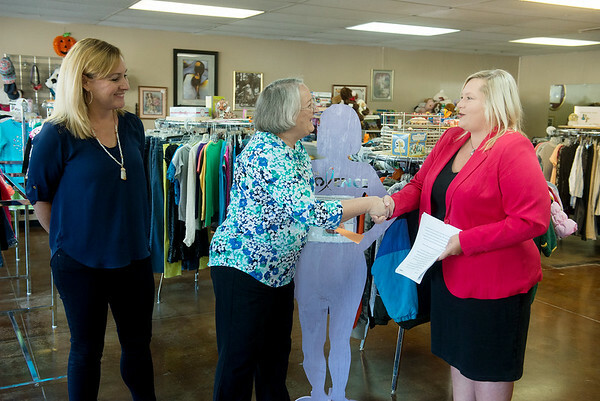 (from left) Louise Secker, development director for Lafayette House, and Alison Malinowki Sunday, executive director of Lafayette House, accept a check for $5,000 from the Verizon HopeLine Grant from Sheryl Blakeley, goverment account executive for Verizon, on Monday at the Second Chances Lafayette House Resale Shop. The donation is in honor of Domestic Violence Awareness Month. The money will go to helping sponsor a paid internship at the store, which functions as an employment training site.